One of the things I love most about my job, is all the cookbook reviews I get the opportunity to do. 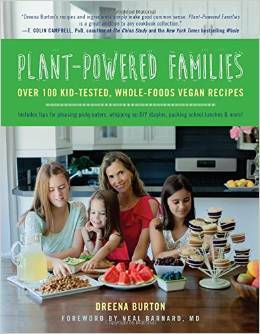 Today my review is of Dreena Burton’s latest cookbook Plant-Powered Families: Over 100 Kid-Tested, Whole-Foods Vegan Recipes. You may already be familiar with her blog, Plant Powered Kitchen. Today I am sharing a recipe from the book. Red Lentil Hummus. What a great idea, right? I love lentils and hummus, but I never thought to make hummus with lentils. Dreena has been vegan for almost 20 years. She also raises her 3 children vegan. In fact, Plant Powered Families has over 100 recipes that have been tested and approved by her 3 children. I love that these recipes are easy and kid friendly. In addition to the hummus, some of the other recipes include: Cinnamon French Toast, Pumpkin Pie Smoothie, Sneaky Chickpea Burgers, Apple Pie Chia Pudding, Vanilla Bean Chocolate Chip Cookies, Creamy Fettucine and No Bake Granola Bars. I can’t wait to make more of the recipes myself. In addition to the recipes, Dreena shares tips on dealing with picky eaters, packing school lunches and stocking a vegan pantry. I am also giving away a copy to one lucky reader. Make sure you enter via the Rafflecopter widget below the recipe! 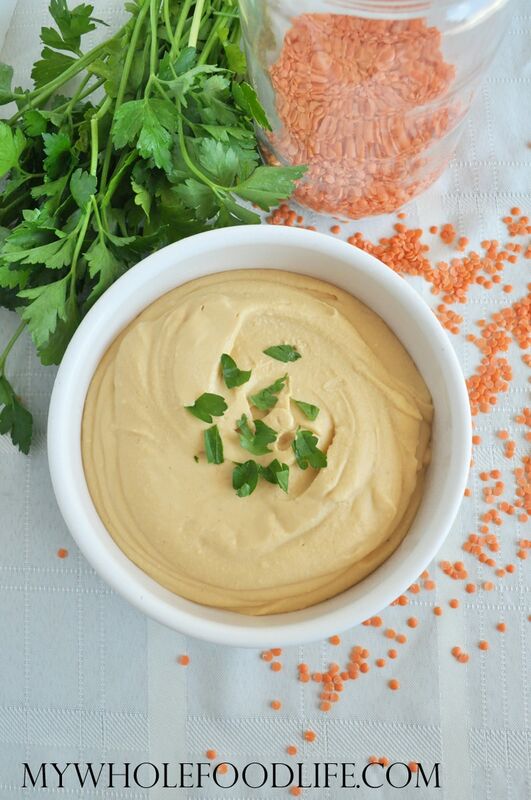 Super easy hummus made with red lentils! In a saucepan , add the lentils and water. Bring to a boil, then turn down and simmer until all the liquid is absorbed. In a food processor , add the lentils and the remaining ingredients and blend until smooth. This mixture is thinner than traditional hummus, but it does firm up nicely once placed in the fridge. This should last at least a few weeks in the fridge. It also freezes well. Enjoy! Recipe from Plant Powered Families . Used with permission. If you would like to purchase or check out more info on Plant Powered Families, you can do so here . Awesome and inspiring. You always amaze us!! Thanks for sharing this recipe and for the chance to win a copy of Dreena's book! Thank you for all your yummy, creative recipes. I want to make every single one of them! I just watched your interview on Live Vegan Vibrantly with Laura Christine Sainz. I loved hearing your story and all the health benefits living a whole food, plant based diet has brought to you and your family. Thank you for sharing. Thanks! It was really good! The picture of the bowl of hummus looks so smooth. This is brilliant quicker to use dried lentils than dried chickpeas. I'll have to try!! Thanks! It was super yummy! Good luck in the giveaway! Finally a hummus my husband might actually eat! He doesn't care for chickpeas, but he loves lentils. I'll definitely have to try this one out! Awesome! I hope he likes it. You can always try with white beans too. Just made the Red Lentil Hummus! Yummy! Used my immersion blender and worked great! Mine was too thick but just added some water. Added a little Tumeric, about 1/4 tsp cuz I add that as much as I can to recipes. Very good and super healthy.